We're often asked about these unusual Cumbrian Sheep who are a familar sight on the Lake District Fells. Here's some background about this much loved breed. It is commonly, but not exclusively believed, that the Herdwick’s earliest ancestors came to England during the Viking invasions between the 10th and 11th centuries. The name "Herdwick" stems from the Old Norse word "herdvyck" which means 'sheep pasture'. The sheep are famous for their hardy and resilient nature and can survive on the limited quality food available in the upland fells. One of the most remarkable aspects of the Herdwicks is their natural tendency to ‘heaf’; a genetic ‘homing device’ which means they can find their way back to where they came from no matter how far they stray. 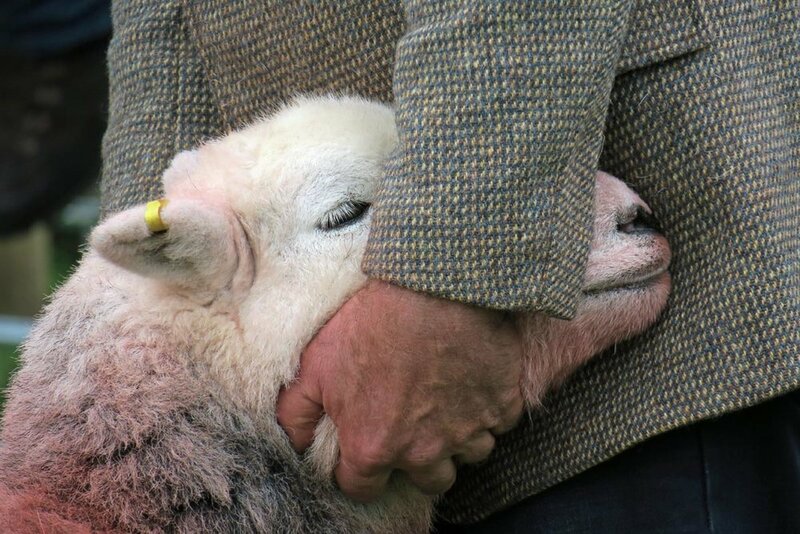 Herdwick farming has been a key influence in the culture and terrain of the Lake District. The world famous children’s author, Beatrix Potter, kept and bred Herdwicks in the latter half of her life. In the 1930s, she won a number of prizes for Herdwick ewes and on her death, bequeathed fifteen farms to the National Trust with the requirement that they all continue to graze Herdwick flocks. The 20th century saw a shift in the economic environment as agriculture turned towards tourism. Keeping Herdwicks became increasingly unviable and at the very worst, fleeces dropped as low as one penny per kilogram at auction. The cost of shearing and getting the wool to the depot were significant and storage space was limited. This led to many farmers burning their fleeces instead of taking them to auction. In the 1990's, the National Trust intervened with a scheme to buy the wool at auction and subsidise the farmers by paying them a guaranteed rate per kilogram for their wool. Unfortunately, this was not to prove sustainable. The demand for the wool did not improve significantly and the National Trust had to abandon the scheme. Farmers only managed to keep going by selling lambs for meat and benefitting from European subsidies, Rural Development Programmes, or from agreeing to adopt sustainable farming practices. The 21st century began with no real change in the financial environment. The demand for Herdwick wool was limited to traditional Lakeland clothing products and carpets, rugs and roof insulation but not enough to change the market price. The Foot-and-Mouth outbreak in 2001 seriously threatened Herdwick survival and replacing the long-standing flocks was not possible because of the cost of fencing that would have been necessary to enclose imported sheep. The government ignored the call for vaccination over culling and the vital identity stamped on the upland fells by the Herdwick was lost forever. Many regard the sheep as an indispensible icon of the region which led to the formation of The Cumbria Hill Sheep Initiative. Their objective is to protect the interest of rare breeds in the region. The Herdwick Sheep Breeders Association, which represents the farmer members, takes on the support functions to enable farmers to maintain the landscape in a traditional way. 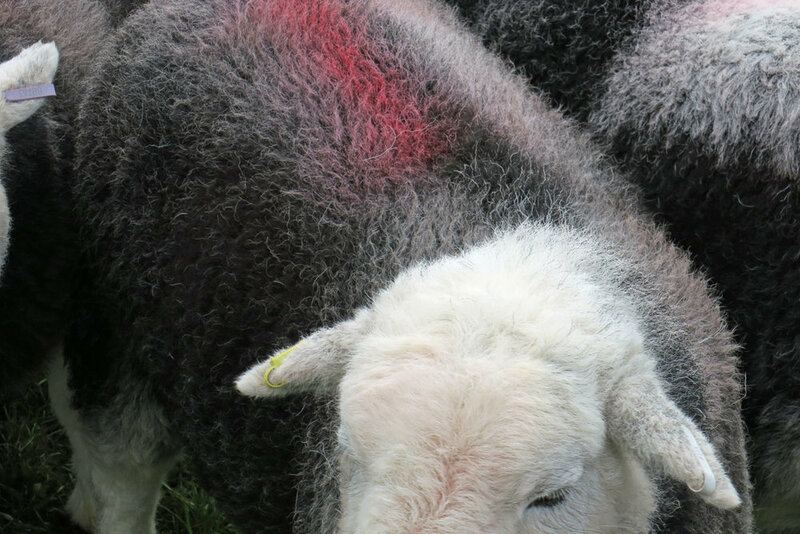 At birth, Herdwick lambs are mostly black and then they gradually lighten to a very light grey in old age. After a year, they turn to a dark brown colour and are called 'hoggs'. Fleeces change to a grey colour after the first shearing. Most Herdwicks spend December to April on the fells without additional feed. They can withstand cold and relentless rain at heights of more than 3000 feet. Rams have horns, and ewes are 'polled' (hornless). For shows and auctions, Herdwicks traditionally have their wool 'ruddied up' (local term for 'raddled') with dye. Rams are also ruddied when put out with the ewes to show which have been mated. 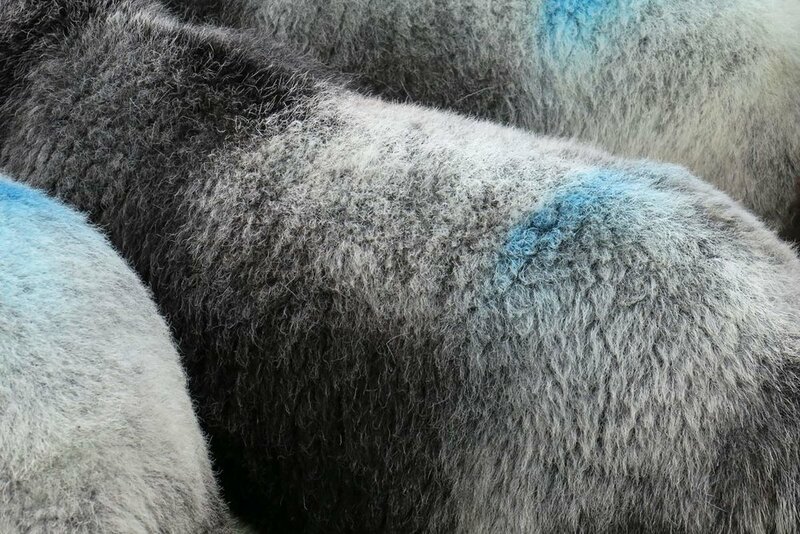 The dye is also a method of marking sheep to distinguish ownership as opposed to ear tags. There are between one and two kilograms of wool at a shearing per fleece. That is approximately the amount of wool that covers one square metre of standard WOCC carpet. Farmers need to shear their sheep for health reasons. 95% of Herdwicks live within 14 miles of Coniston, Cumbria. The Herdwick can be seen in Cumbria around the Duddon valley, the Coniston fells, the Buttermere fells, throughout Borrowdale, Wasdale and up to Scafell. It is also to be seen in South West Scotland, the Yorkshire Dales and occasionally elsewhere in England. There were around 100,000 Herdwicks before the Foot and Mouth Crisis which claimed about 25%. Ewes teach their lambs how to 'heaf'. Unheafed sheep cause over-grazing because they wander. Herdwicks also produce strongly sweet-flavoured lamb and mutton. The former is in great demand, particularly in top class Cumbrian restaurants. Reference is gratefully acknowledged to Wikipedia in the above compilation.